Transport is the second on our list of 5 things we can all start doing right now to beat the climate crisis. LCWO aims to promote the use of low carbon means of transport. Members of LCWO are currently involved in the development of the Go Ultra Low project in Oxford, a project to provide electric car charging for people who have to park their car on the street. The City and County Council project is trialing six different types of chargers across the city, and partners Co-wheels car club will be introducing 10 new electric cars to boot. LCWO Transport working group members Neville and Fiona Schrivener are playing host to one trial charge point on Riverside Road. They have an outside charge-point fitted on the bay window, and hope to use some of their own solar power to charge their Toyota Prius Hybrid. 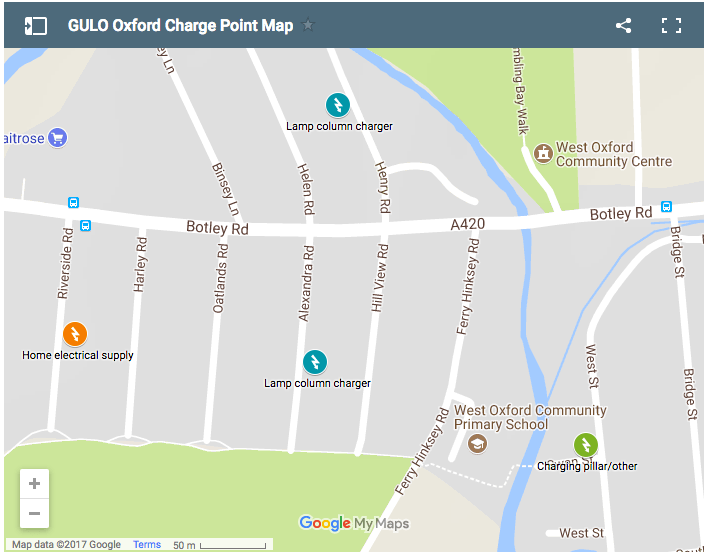 Other West Oxford chargers are on West Street (a charging post with an EV only bay), Henry Road and Alexandra Road where Co-wheels will be bringing in a new electric car club car. You can check out the charging points on the map here: charge point map. LCWO is a member of the No Expressway Alliance, and opposes the building of the proposed Oxford-Cambridge expressway, along any of its routes. Find out more avout the alliance here. In 2009, LCWO helped set up a local Zipcar scheme which now has a car at the Community Centre, plus a car and van at the Railway Station. More than 170 people have become members of the scheme and at least three families have given up owning a car as a result, saving around 80 tonnes of CO2 per year. LCWO supported the successful city campaign for 20mph speed limits on residential roads and under the railway bridge, which should hopefully contribute to a long term shift encourage people to walk and cycle locally. LCWO also persuaded the County Council to set an advisory 30mph speed limit on Binsey Lane, improve the pavement under the railway bridge, and remove some cycle barriers. LCWO helped with work to develop a cycling map for Oxford, that shows both the routes on the main roads, and the quiet routes that avoid the traffic. See the Cyclox website for more details. In association with Cyclox, LCWO has a list of small-scale improvements that would help people walk and cycle through, to and from West Oxford. Want to join others and get involved in work like this? Drop us a line!